When a doctor told me that 2 beers or 2 glasses of red wine a day for a man is healthy I wanted to look more into it. He said that it’s half that amount for a woman. Red wine is the drink that gets the spotlight as a healthy alcohol. However, not everyone enjoys red wine. Beer is another option that many people overlook. Drinking beer does have many health boons, but you should have control over your drinking. While drinking beer can help reduce your risk of certain diseases if you are drinking in moderation, it can also increase your risk of some serious diseases. ‘Moderate’ drinking is only one to two drinks per day. A drink of beer is 12 ounces, wine is 5 ounces, or hard alcohol is 1.5 ounces. Your risk of other diseases and health problems starts to jump if you drink more than one or two drinks per day. Instead of focusing on the negatives of drinking, let’s look at health benefits of drinking. All types of alcohol in moderate amounts can help the lower the risk of heart disease. Beer helps lower your blood pressure. It also lowers your LDL cholesterol and increases your HDL cholesterol, which is very important for reducing your risk of heart disease and other health issues. Beer contains silicon, which is an important compound for creating strong bones. Silicon can also be found in whole grains, green beans, and cereals. Beer also contains magnesium and phosphorous, which are two other minerals that your body needs to build strong bones. However, too much alcohol can cause the bones to weaken. So, you should drink your beer in moderation. Most times, beer is made from grains, including barley. This is why it is full of many of the same nutrients that are found in grains, which include fiber, protein, and vitamin B. 12 ounces of beer has up to 2 grams of protein and 1 gram of fiber. This is not a huge amount, but it is still worth noting. Darker beers tend to have higher amounts of fiber than lighter beers. Beer has the least amount of alcohol per volume when compared to spirits and wine. This greatly affects how quickly that the alcohol dehydrates the body because the higher amounts of alcohol you consume, the faster that your body dehydrates. Even if you are drinking beer, you should also make sure that you are drinking water to keep hydrated. Red wine is known for helping to reduce your risk for many diseases. Drinking beer in moderation has been linked to a lower risk of high blood pressure, diabetes, heart disease and some cancers. 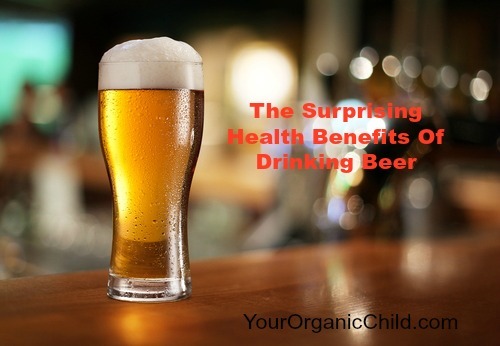 Beer contains antioxidants, which are most likely responsible for many of these effects. Most of the time, beer is made from hops and barley, which are completely different from wine, so there are different antioxidants in it. There has been some research recently released that has found men who drink beer will have lower risks of kidney stones, especially compared to men who drink other types of alcohol. This could be caused by the combination of the higher water content and beer being a diuretic. There are studies that show people who consume beer in moderation are far less likely to develop Alzheimer’s disease. This could be a benefit of the silicon that is in the beer because silicon helps remove metals from the body. Many metals are toxic to our bodies and can create the degenerative pathologies that lead to neurodegenerative diseases. Beer can also help with concentration, so it also has mental benefits. Your immune system is your body’s main way of fighting off most diseases, which is why you should be eating foods that help boost your immune system. Beer has some properties that help boost your immune system, which can help your body fight off the flu or other infectious diseases. Depending on the illness, beer can also reduce the symptoms or the disease’s duration. In many homes in Germany, a home remedy for a cold is a warm glass of beer. This home remedy unclogs the nose and improves circulation. Beer contains a chemical called xanthohumol, which is a type of polyphenol and is found naturally in hops. Xanthohumol is an antioxidant that has been found to prevent and inhibit cancer cell growth. For some types of cancer, xanthohumol acts as chemo prevention. After a long day of work and running around, there is nothing that is more enjoyable than putting your feet up or soaking them in warm water. This can help your feet relax. However, you can soak your feet in beer, which is more relaxing. This does have drawbacks: you cannot drink the beer you have soaked your feet in, and your feet will be sticky for a few minutes. Catherine Zeta Jones has been claiming that beer has many benefits for hair health. She uses all natural hair treatment to keep her hair soft and shiny. This scent of the beer does stay in the hair, which you can reduce using perfume and other scented products. The hair benefits from both the protein and vitamin B that is in the beer. In New York City, there is a Beer Spa, but there are other spas around the world that use beer. These beer spas have soaking tubs that are filled with darker beers. There are spas that offer beer masks. These skin treatments hydrate and nourish the skin with the high amounts of vitamins in beer. The main difference between beer and the other alcoholic beverages is that beer is made from hops. Hops are the ingredient that have antibacterial and anti-inflammatory properties, which protect the body from specific diseases that are caused by aging and other health issues. There have been studies that have shown that dietary fiber will help fight constipation and bad cholesterol. Drinking barley beer can help you get your daily dose of dietary fiber, which means that beer is the second best nutritional drink you can consume, right after water. Your eyesight is one part of your health that you may not be thinking about. Many people do not know that beer has overall benefits for your eyesight. However, beer can help people who have cataracts. Consuming a glass of wine daily can help reduce the risk of glaucoma in people who have diabetes. This is also the case with black and dark beers. It seems like the second that you start drinking a beer, you feel the need to use the toilet. This is because beer is made with over 90 percent water, large amounts of potassium, and a tiny amount of sodium. The high percentage of water is what causes you need to go to the bathroom. Beer is one alcoholic drink that is easily overlooked for its health benefits. There are many other benefits of drinking beer, but you should limit the amount of alcohol that you drink. One to two drinks per day is more than enough to see the health benefits of them. Many times, drinking too much can lead to many health issues, so you should always drink responsibly.